How Can Diabetes Affect Eyes? Are eyes the first thing you think of when you think of diabetes? Probably not. But the truth is that diabetes can cause serious eye complications that can even lead to vision loss. If you’re a family caregiver to an older adult who has diabetes, learning more about diabetic eye disease could help to prevent vision loss. Since November is Diabetic Eye Disease Month, what better time than now? Just as high blood sugar levels can damage other parts of the body, it can also harm the eyes. Having high blood sugar can make tissues in and around the eyes swell because it affects fluid levels. Usually, the blurriness is temporary and is resolved when blood sugar levels return to normal. When blood sugar levels remain high for a long time, it can harm the blood vessels located in the back of the eyes. Fluid may leak out of the blood vessels. Additional blood vessels may also form in the eye, but they won’t be as strong as they should be. The weak blood vessels may bleed or make pressure in the eye too high. They can also cause scarring. Glaucoma: People with diabetes are at double the risk of developing glaucoma. It is a condition that damages the optic nerve. People with glaucoma might not have any symptoms at first. As the disease progresses, it causes vision loss. Diabetic Retinopathy: The retina is located at the back of the eye. Its purpose is to take light and translate it into signals for the brain that the brain uses to determine what you’re seeing. Blood vessels that are damaged can result in damage to the retina. Initially, the blood vessels may bulge, leak, or get weaker. Later, the blood vessels can become blocked, which makes the body produce new blood vessels. These new blood vessels result in loss of vision. Diabetic Macular Edema: The macula is part of the retina that makes it possible to read, drive, and see faces. The damage done to the macula by diabetic macular edema results in loss of sharp vision. Cataracts: Cataracts make the normally clear lens of the eye turn cloudy so that it is difficult for light to pass through. People with diabetes often develop cataracts at a younger age than they would otherwise. If your aging relative has eye problems due to diabetes, senior care can help them manage the disease and improve their quality of life. 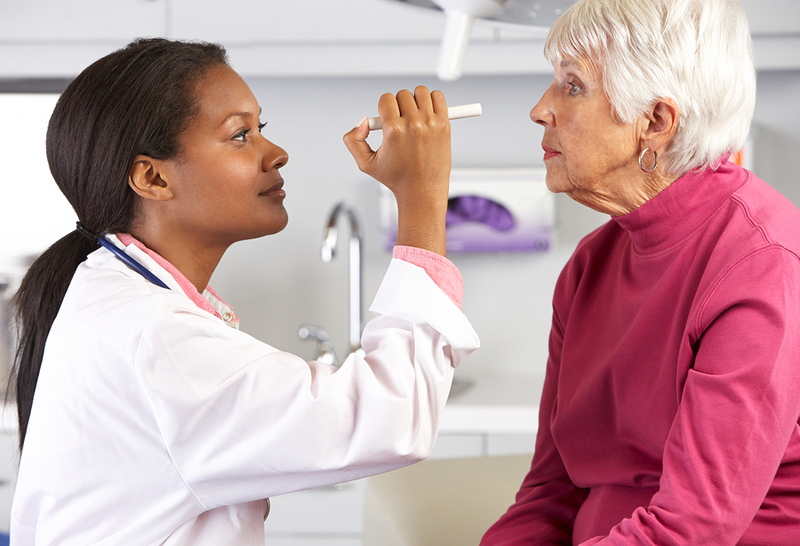 Senior care providers can remind them to use medications prescribed by the doctor and drive them to eye exams. A senior care provider can also help them with things that are difficult due to low vision. Senior care providers can help them read their mail, books, newspapers, and magazines. Senior care providers can also help them to walk safely, avoiding uneven surfaces or items they may trip over.